The friendly team at Vitaphysical deliver treatments that free you from pain and help you find a happier, healthier you. At Vitaphysical’s centre just 20 minutes from Houghton Le Spring, we offer osteopathy and massage therapy treatments designed to relieve pain and promote relaxation. Originally named the Sunderland Back Pain Centre, Vitaphysical first opened in 2007 under the direction of founders Jason and Bronyia. The team and service offering has since expanded to provide a comprehensive range of treatments for your body, changing its name to Vitaphysical in 2012. A back pain clinic is still in operation at our centre and runs alongside other sessions addressing conditions that cause chronic pain, including neck pain and frozen shoulder. We also offer courses of treatment to restore movement and function following accident and sports injury. 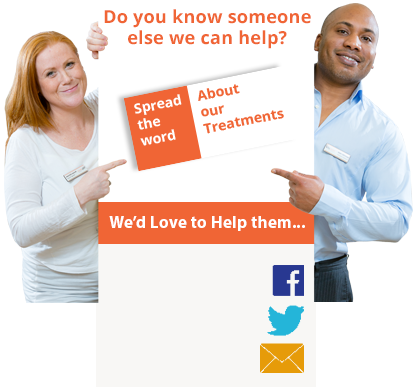 You can find out more about our services on our what we treat page. Our professional team love the work that they do and each has their own specialism. The work of our osteopath Jason is complemented by our massage therapists Bronyia, Emma and Kirsty and their full range of massage treatments. Deep tissue massage, full body massage, relaxation massage and Thai massage are among the treatments on offer, alongside sports therapy and pregnancy massage for mums to be. To help you decide which course of treatment is most appropriate for your personal circumstances, please call Jason our osteopath, who will be more than happy to discuss your case. Because pain can strike without warning, we also offer an emergency appointment service. In these extreme cases we are usually able to offer you a same day appointment. Most of our clients come to us through word of mouth recommendations from family or friends who have visited our clinic and been pleased with the results. Many of our clients arrive at our centre having undergone physiotherapy treatment or visited private chiropractors with limited success. We’re incredible proud of the high level of service and satisfaction we offer our clients and are able to share with you many of their stories on our patients success stories page. You can book an appointment with us using our online booking form or call 0191 565 8886 or email info@vitaphysical.co.uk. Vitaphysical is a 15-20 minute journey along the A690 from Houghton Le Spring and free patient parking is available on site. Our location is also a short distance from Sunderland train station and metro station. Visit our find us page for further information. We look forward to welcoming you from Houghton Le Spring for massage or osteopathy treatment at Vitaphysical soon.